6:00pm – Family-friendly kiddush…with ponchkas! During the service….there will be Aboriginal community members joining us at Shule, including descendants of Uncle William Cooper himself. 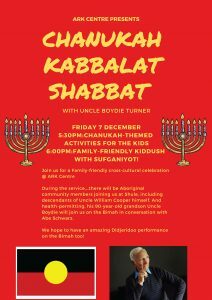 And health-permitting, his 90-year-old grandson Uncle Boydie will join us on the Bimah in conversation with Abe Schwarz. We hope to have an amazing Didjeridoo performance on the Bimah too! Come one, come all…this is going to be a Chanukah Shabbat to remember! !